Judy O’Malley has been in publishing for over thirty years as an editor of children’s trade books and magazines, professional books and magazines, and educational materials. Now a freelance editor and consultant, most recently she was the Executive Editor of trade books for Charlesbridge Publishing in Watertown, Massachusetts, where she developed and directed new lines of transitional books, including early readers, early chapter books, and middle grade chapter books. In addition, Judy works one on one with writers coaching them to achieve publishable manuscripts and speaks to a wide range of audiences at conferences, writing retreats, symposia, and seminars on children’s literature locally, across the country and throughout the world. 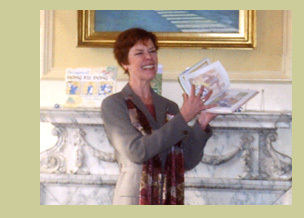 She presents workshops for writers and illustrators, teachers and librarians, literacy workers, and the general public. Until March 2004 she was the Editorial Director of Houghton Mifflin Children’s Books, where she coordinated acquisitions and editorial development of all titles on that list as well as acquiring and editing titles by noted authors and illustrators. Before joining Houghton Mifflin Company’s Boston office, she was an editor at Cricket Books in Chicago, Illinois, where she also launched a nonfiction magazine for children aged 7 to 10, ASK: Arts and Sciences for Kids. Previous to her work as editor of trade books for children, she was the editor of Book Links: Connecting Books, Libraries, and Classrooms, a publication of the American Library Association, and had been an associate editor for H.W. Wilson Company, working on professional books and materials for teachers and librarians. Among the authors and illustrators Judy has worked with are: Jane Yolen, Avi, Katherine Paterson, Eve Bunting, James Cross Giblin, Russell Freeman, Chris Raschka, Liz Rosenberg, Kathleen Krull, Nikki Grimes, Ed Young, J. Patrick Lewis, Lee Bennett Hopkins, Maxine Kumin, Robert D. San Souci, Janet Wong, and Olivier Dunrea.